We are happy to announce Azure Government documentation! This documentation provides guidance that is tailored to our Azure Government customers. We highlight common solutions and guidance on building government specific implementations, as well as information that you need to know about using services, Marketplace, Portal and PowerShell in Azure Government. This is just the start! Many more updates are planned as we continually expand our offerings for Azure Government. As new services come online, we will update the corresponding documentation. Over the coming months we will add additional content on how to build solutions and onboard successfully. We encourage and welcome feedback and documentation requests you have. Please comment on this blog post with any questions, recommendations, or comments in relation to our new documentation site. Navigate to the new Azure Government Landing Page through the secondary navigation bar. 2. 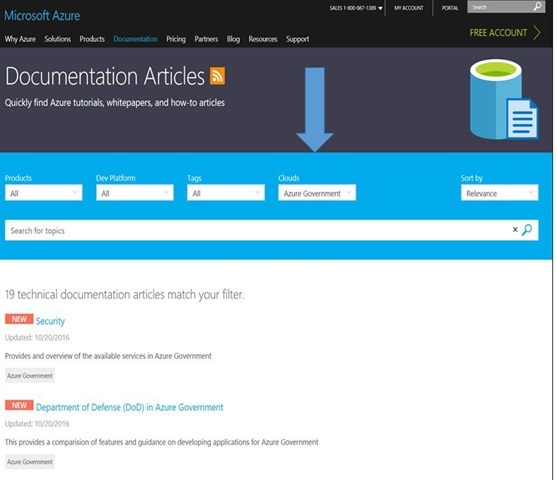 Access the page directly at Azure Government documentation. 3. Select “Azure Government” from the Microsoft Documentation Articles cloud filter drop down menu. To stay up to date on all things Azure Government, be sure to subscribe to our RSS feed or receive emails by clicking “Subscribe by Email!” on the Azure Government Blog.